Cedar is one of the oldest ingredients used in fragrance, with a distributive woody scent that cannot really be broken down much further. 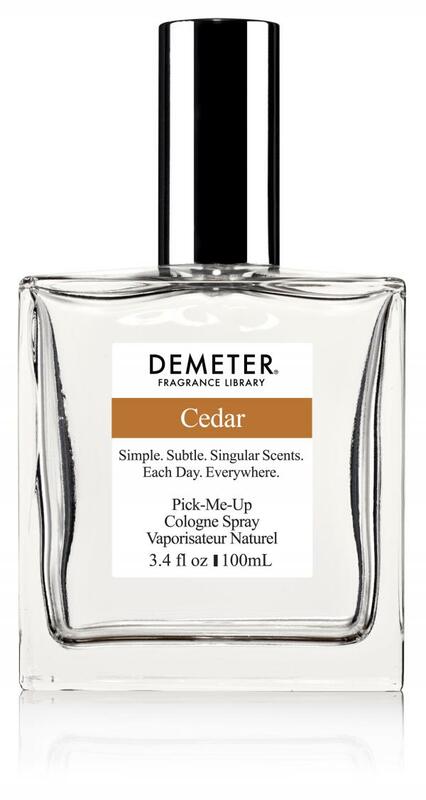 Demeter's Cedar uses natural cedar from Virginia to create a smooth and eminently wearable fragrance. THIN sheets of blue smoke among white slabs... near the shingle mill... winter morning. Falling of a dry leaf might be heard... circular steel tears through a log. Slope of woodland... brown... soft... tinge of blue such as pansy eyes. Farther, field fires... funnel of yellow smoke... spellings of other yellow in corn stubble. 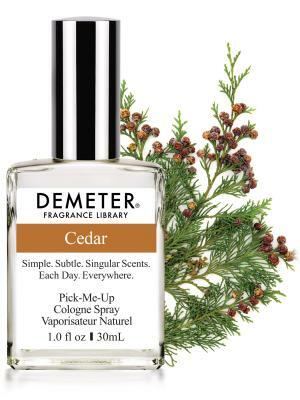 Bobsled on a down-hill road... February snow mud... horses steaming... Oscar the driver sings ragtime under a spot of red seen a mile... the red wool yarn of Oscar's stocking cap is seen from the shingle mill to the ridge of hemlock and cedar.